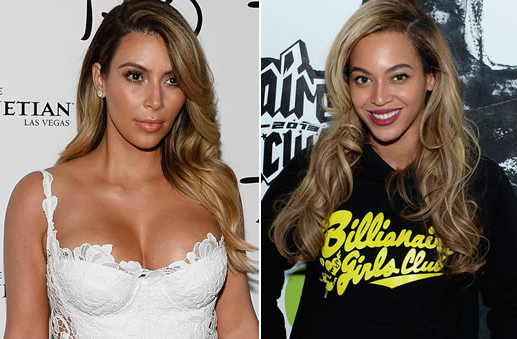 Sources claim Kim Kardashian is obsessed with Beyonce and Googles her multiple times a day. Isn't Life & Style on the Kartrashian payroll? Which means PMK is the "so-called 'insider'". I never thought of Kim as bi, or even experimental, but reading this gives me the feeling that her obsession with Bey is actually sexual in nature. I think Kim was obsessed with J-Lo at one point, too. I don't think it's Kim that's obsessed with Bey at all. I think Kanye is, and he's trying to clone Kim into her image right down to the blond hair. Sidebar: It's a damn shame that a white woman has to dye her hair blond to imitate a black woman. 10:22, you said exactly what I was thinking. The only reason Kim goes along with the fuckery is because she wants to befriend Beyoncé for more fame, and Kanye is the best route. a lot of people Google her to hear the dirt about her and don't like her point blank period. I am dying at the sidebar above. LMAO. Tsk Tsk tis a shame tisn't it? Dang.